SO FAR ALL JACKPOT PLAYED MATCHES HAVE WON. WE EVEN GAVE PREMIUM JACKPOT FOR FREE HERE LAST WEEK AND AS AT WRITING THIS, ALL THAT HAVE PLAYED ARE CORRECT. NO FREE PREMIUM JACKPOT FOR MEGA. IF YOU LIKE, YOU CAN BUY PREMIUM OR USE THE FREE ONES. YOU CAN OPEN THEM ON HOMEPAGE TO CONFIRM RESULTS FOR ALREADY PLAYED PREMIUM PREDICTIONS. LATEST: LAST WEEK MEGA JACKPOT, GOOD PERFOMANCE! JACKPOT WON 12 CORRECT. THIS WEEK’S PREMIUM JACKPOT PREDICTIONS ARE READY AND SENT THROUGH TEXT! IF YOU NEED SCREENSHOT FOR LAST WEEK, CONTACT. DON’T BE LEFT OUT WHEN IT HAPPENS. ? MJOMBA MDAILY (Daily matches) COST 100. Sonderjyske vs Randers prediction. Both Sonderjyske and Randers have each won two, lost two and drawn two from their last 6 head to head encounters. Both teams score goals which is another thing you want to look at. For instance, in their previous 5 matches, Sonderjyske has scored 14 goals while Randers have also scored 14. SONDERJYSKE VS RANDERS PREDICTION- LAST SEASON SNEAK PREVIEW. Sonderjyske finished 6th place last season which is a good achievement for them and will therefore be focussed on making better attempts at runners up or first position this season. What makes this dissapointing is the fact that they have finished in 6th place the second time and will therefore, as said earlier, be pushing on and probably challenge the Europa League. SONDERJYSKE VS RANDERS PREDICTION-PRE SEASON CAMPAIGN. If you look at the pre-season campaign, Sonderjyske appears promising after thrushing Horsens as well as Esbjerg. They will be looking to carry the goal scoring form into the league this season. Randers have equally had a great time in their pre-season campaign. However, last season was a dissapointment which still lingers in their mind. Remember they had to push through relegation playoffs, eventually finishing at position 7. This is the second time they are finishing outside the top six bracket in a span of 5 years. WHAT WE THINK ABOUT SONDERJYSKE VS RANDERS PREDICTION? This is going to be a sore spot for this team and a reminder of last season. Critical is the fact that they only managed 4 away wins all season and out of those two came in the opening weeks of the league. This tells you Randers performed poorly last season. In their previous 11 matches last season, they only managed 1 win losing 8 times in the process. Actually, these defeats are still fresh, having happened just over a month ago. Until they prove themselves, Sonderjyske is definitely going to be a hard nut to crack. Sonderjyske have the home advantage and given the fact that this team scores goals, you don’t want to side with anything but a home win. We foresee a 2-1 or 3-1 kind of result but to play safe, both teams will score. HOW TO DEPOSIT MONEY TO SPORTPESA VIA MPESA. As a beginner in betting, one of the very first things you need to learn is how to deposit money to sportpesa via mpesa. The process is simple so you should not encounter any trouble. Having created your Sportpesa account, lets dive into how to deposit to sportpesa. Mpesa account loaded with the amount of money you want to deposit to Mpesa. You can take a look at the above picture. This is the kind of confirmation message from Safaricom you receive for a successful transaction. Type your Mpesa PIN and click OK.
You will receive two confirmation messages. One from Safaricom M-pesa and another from SportPesa both confirming that you have successfully deposited to SportPesa. Depending on your location and network, the message might delay a little but not too long otherwise you may want to check your Mpesa account balance to confirm whether or not the amount has been sent before you can decide to go over the process one more time. 99 percent of all the time, the messages are instant so go ahead and learn how to place a bet with SportPesa having successfully deposited money to your SportPesa account. Please remember that you will incur just the normal Mpesa transaction fees. The normal fees will also depend on the amount of money you deposit to sportpesa. For example, I was charged 33 shillings upon sending 1,000 to sportpesa to place my bet. See above picture. If you encounter any problems, feel free to write a comment so that we can help resolve. HOW TO REGISTER SPORTPESA ACCOUNT – SMS – ONLINE REGISTRATION. Wondering how to Register Sportpesa Account – SMS – Online Registration? There are basically two ways in which you can become a member of the SportPesa betting fraternity. One of them is through SMS and the other one is through online. Both are very easy and fast to follow when joining SportPesa. 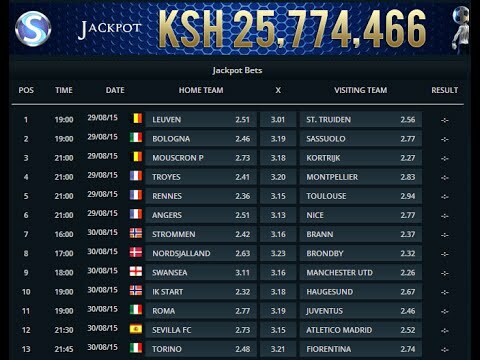 Online, you can register at sportpesa.com. There is good money on stake so if you want to try the fun, then read along to know exactly what you need to do to register with SportPesa and start betting. Before we show you how to start sportpesa registration, there are a couple of few things you need to know. One, betting involves some risk. Two, you will need to top up your Sportpesa account with an amount which you want to use when placing a bet with sportpesa. To deposit to sportpesa, you use Sportpesa Mpesa Paybill Number 955100. Withdrawing money from SportPesa is very simple. Once you have won, you just head over to withdraw, enter the desired amount, type confirmation code (Just to confirm that this is really your account) and click WITHDRAW.